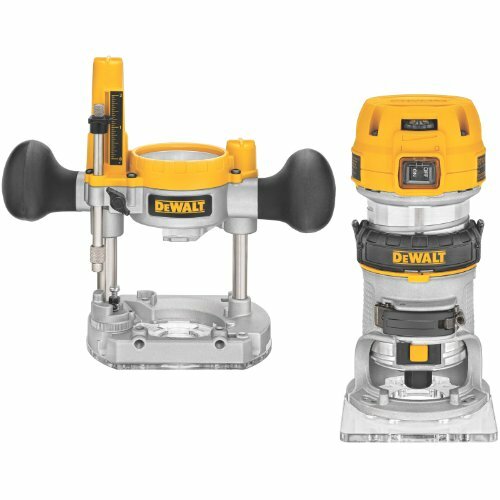 Dewalt is a company known to make design upgrades in their wood routers after listening to customers and the DWP6611PK is advertised to be the most well-thought-out routers. We tested it and here is our review. Out of the box, the routers looks compact. You expect this from a low power router but Dewalt have gone an extra mile with this. Now don’t let the small size fool you, the features and the capabilities of this router, are top of the line. You get two different bases, the fixed and the plunge, variable speed settings, some amazing adjustment capabilities and high end features like the soft start. The feature set probably makes this low power router a bestseller. The Dewalt DWP611PK has a perfect combination of metal and plastic. The manufacturers have used high grade aluminium in areas which take the maximum load, while they have gone with plastic to house the motor. This combination makes the router super lightweight. This router has a 1.25 horsepower 7 amp motor which makes it suitable for medium to low load operations. You also get variable speed which range from 16,000 to 27,000 rpm. The variable speeds makes it possible to use different sized bits more effectively. The diameter of the two bases is on the lower side but you can make a lot of adjustments with the depth of the cuts. The DWP611PK comes with two bases, the fixed and plunge. Its size and construction is similar to the Bosch Colt. It is quite easy to change the bases and both of them lock nicely with the motor. You can change the speed with the help of a knob. The standard recommendation is to use the first three levels for larger bits and the other three for smaller bits. The fixed base offers nice one hand operation and can help in achieving precise cuts. You can use the plunge base in any direction you want. If you don’t like the traditional position where the speed dial and the switch face you during the operation, you can easily make 180-degree change. Overall both the bases give you a lot of flexibility to handle all kinds of cuts at decent power. We were in awe of the kinds of adjustments you can make with this router. It reminded us of the Festool 1400 EQ, but that is one heavyweight router. Clearly the DWP611PK offers great value regarding adjustability. With the fixed base you get 360-degree micro adjustment ring that helps to achieve the perfect depth. On the plunge base, you also get five position turret which allows greater depth control. The adjustable reference needle can be used to get precise cuts at the right depth. We were also quite impressed with the locking mechanism for both the fixed and plunge bases. Apart from that, you can lock the bit at any position you want which makes its quite convenient. With such micro adjustments you can get the exact cut. This capability make this router a sure shot winner. Finally this Dewalt router offers a lot of convenience. While reading the customer reviews we found that the LEDs were quite appreciated. We were little apprehensive about that. But once we started working on the router with the LEDs, we were absolutely addicted. It really enhances your performance as you are able to clearly see whether or not you are getting the desired results. It’s fair to say that LEDs should be made an industrial standard. The handles on the plunge base are also of good quality. Usually with compact routers you get sub-par handles, but the rubbery texture on this makes it nice to hold. As we said earlier, you can easily switch the two bases, which adds to the convenience of the Dewalt DWP611PK. There is nothing much to complaint about this router. However handles on the fixed base like the Bosch 1617EVSPK, would have made its use much more comfortable. You also don’t get any edge guide but that can be purchased separately. The biggest issue would have to be the power cord. It doesn’t look durable and you might have to get a replacement after some time. It is a compact router with all the features you would expect in a high end router. This makes it the clear winner and must have for low load operations. If you do light woodworking and use routers for simple operations, you should definitely get this. For heavy woodworkers this can prove to be a great alternative while handling simple operations. Bosch RA1181 Router Table Review – Do NOT Buy Before Reading this! 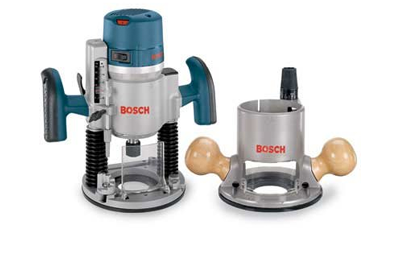 The Bosch RA1181 is the best selling router table on Amazon and for all the right reasons. 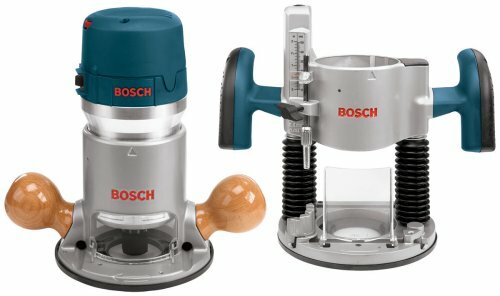 While Bosch might not be premium brand like Festool, it definitely delivers the best value-for-money router tables in the market and Bosch RA1181 is a pretty good example. This table is built for the DIY dads and casual woodworkers. However, If you’re planning to take up complex or professional projects, you might want to invest into something a little more high on performance. At first look, the Bosch RA1181 comes off as a sturdy and ergonomic router table. Despite the low price, the RA1181 boasts every important feature that you’d need from a router table. From a large work-surface to an aluminium router plate and an efficient dust collection system, it covers all your bases. The router table comes in three major parts i.e. the table, the router plate and the fence, thus the assembly process is pretty straightforward. What we like about it is that it’s a 27”-long by 18”-wide cast aluminum table which is as close as it gets to a full scale models. The surface is very flat and is designed to reduce friction when sliding the piece across the table. The RA1181 features a standard ¾”-wide by 3/8”-deep miter slot that runs along the table and is compatible with any common miter guide or jig. One thing we loved about the Bosch RA1181 is that it comes with an sturdy cast aluminum router plate that comes pre-drilled to be compatible with a variety of routers. That means if you already have a router that you love, there’s a good chance that you wouldn’t have to buy a new one just for the sake of upgrading to a table. The router plate is tough enough to counter the torque created by even powerful routers like the 3 1/4Hp Bosch 1619EVS. It also comes with three snap-in inserts that reduce the diameter to 1”, 2” or 2 ¾” as per your requirement. The adjustable fence is supported by an aluminum extrusion 25”-long by 4 7/8”-tall and a pair of 12 ½”-long by 3 ¾”-tall MDF (medium density fiberboard) that can produce a center gap from 0 to 3 ¾”-wide and thus you can use a bit of size upto 3 ½” in diameter. The RA1181 features a dust collection system that can be attached to a standard 2 1/2-inch hose. Apart from the router table, you get a set of three mounting-plate insert rings, router mounting hardware, dual-outlet 15 Amp switch with overload protection, two adjustable featherboards, adjustable clear guard, starter pin and guard, and two 1/16-inch outfeed fence shims. So that covers up pretty much everything you’d need to get started with most of your basic projects. All in all, the Bosch RA1181 is a very well-designed, sturdy and functional router table that offers ample of working space and at this price tag, it makes for the perfect table for DIY guys and new woodworkers.